Joel Stern er kurator, artist og forsker som er interessert i teorier and praksiser innenfor lyd og lytting. Han er meddirektør for Liquid Architecture, en ledende australsk organisasjon for kunstnere som arbeider med lyd, og har grunnlagt prosjekter som OtherFilm og Instrument Builders Project. Joel har arrangert festivaler, publikasjoner, utstillinger og konserter i Australia og internasjonalt. I 2018 var han kurator sammen med James Parker i Eavesdropping, en stor undersøkelse innen lyting av politikk og etikk. Joel produserer og utfører eksperimentelle musikkverk under eget navn og i band, inkludert Sky Needle og Soft Power. Han er PhD-kandidat i Curatorial Practice på Monash University, Melbourne. Joel Stern is a curator, artist and researcher interested in theories and practices of sound and listening. 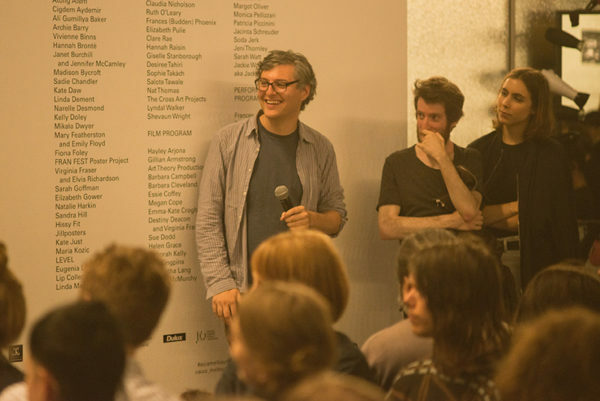 He is co-director of Liquid Architecture, a leading Australian organisation for artists working with sound, and has founded projects including OtherFilm and Instrument Builders Project. Joel has curated festivals, publications, exhibitions, screenings and concerts in Australia and internationally. In 2018, with James Parker, he curated Eavesdropping, a major investigation into the politics and ethics of listening. Joel produces and performs experimental music works under his own name and in bands including Sky Needle and Soft Power. He is a PhD candidate in Curatorial Practice at Monash University, Melbourne.